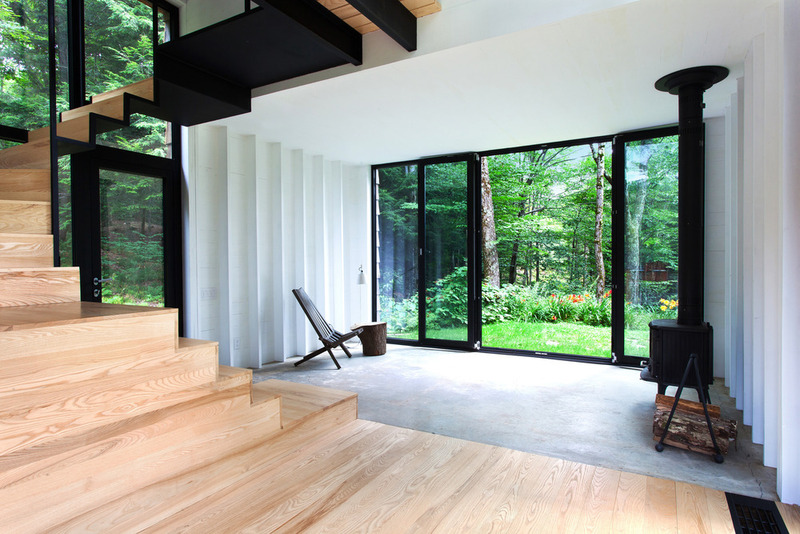 YH2 Architecture’s design for a rustic retreat in the woods outside Sutton, Québec, is exactly the kind of house that birds might like to nest in, were they human-sized. 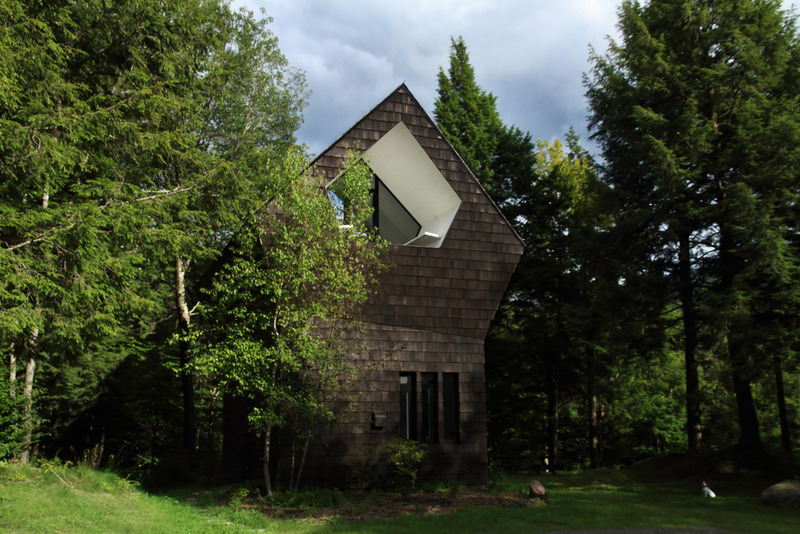 According to YH2 principal Marie-Claude Hamelin, the building started life as a storage shed, which the owners had converted into a rustic cottage some years earlier. As devotees of nature (one half of the couple is a landscape artist, the other a horticulturalist), they loved its primitive, simple demeanour — the cottage was neither electrified nor plumbed, with only an outdoor privy for comfort — and wanted that same spirit of simplicity in the renovation. They also wanted the original footprint retained, and that the surrounding woods should be disturbed as little as possible. This included a ban on heavy machinery, adding to the challenge. 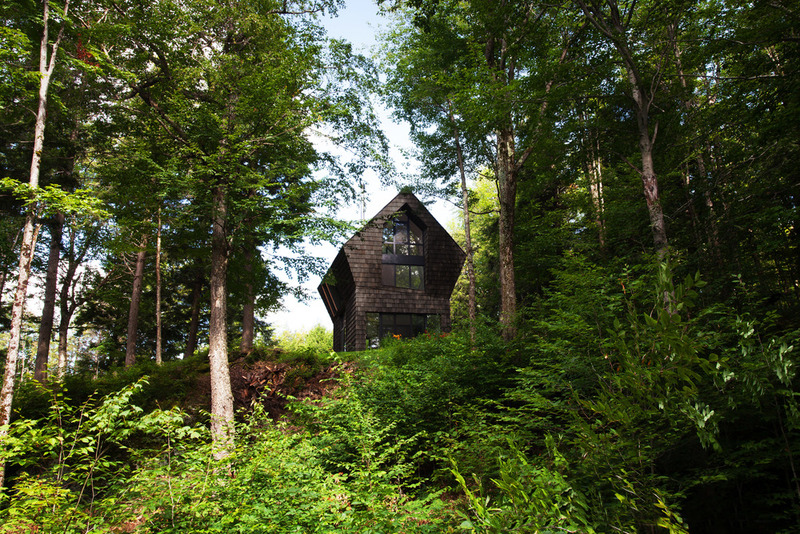 From a distance, the cottage’s silhouette rising out of the woods bears a striking resemblance to a tree. Hamelin, along with partners François Bélanger and Loukas Yiacouvakis, came up with a plan that comprised ballooning the upper two storeys out and above the main floor; this added space on the upper floors, but also embodies the fanciful metaphor that characterizes the design as a whole. Its silhouette irresistibly resembles the sturdy trunk and broadening canopy of a tree, harmonizing with the thick woods that surround it. Bark-like cedar shakes cladding the exterior from grade to roof complete the illusion. 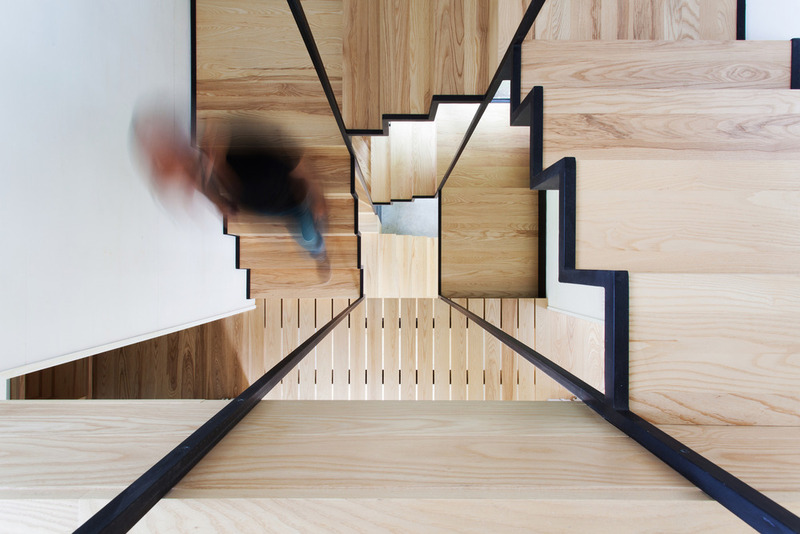 The staircase, unspooling through a glazed shaft, looks simple but is anything but. On the main floor, glass doors and wall-height windows blur the division between house and landscape, and can be opened fully on warm days. There are virtually no interior walls; instead, more creative ways of defining space, such as changes in floor planes and materials, help to create the various zones. Looking down through the stair shaft from a perch at the top of the house. In the kitchen at one end, a trio of tall windows reduced cabinetry space to waist level and below; here, the team deployed the first instance of origami-esque folding, by inserting extra cabinetry under the stair landing. The curve of the staircase creates an enclave for the entry door, with built-ins for coats and boots. Elsewhere, a calm palette of white walls (with, in some places, exposed studs), ash wood trim and concrete floors, are the only finishes. Bridges in the air and oddly angled windows enhance the oddball charm. The staircase is, in itself, a marvel of structural art. Winding up through an open, window-lined shaft to the roof, it gains strength from a pair of slender steel posts that extend from the roof to the second-floor landing, allowing it to hang over the main floor. The stair strings are black-painted steel with ash upper surfaces; viewed from below, they really do look like accordion-folded origami paper. Looking across the floating bridge. 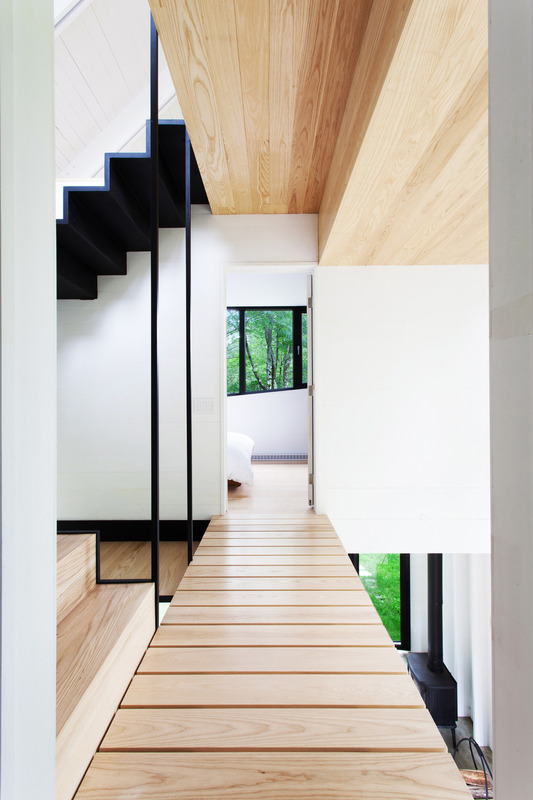 At the second floor, a slatted bridge open to the floor below joins the landing to the master bedroom. 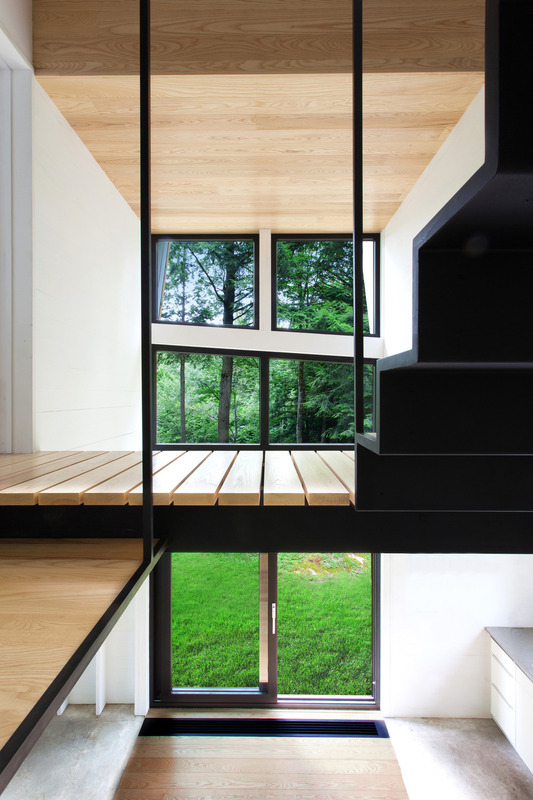 On this level, as elsewhere in the cottage, variations in the floor plane replace walls as a way of defining spaces. A step down at one end of the bridge leads to the ensuite. The top floor, as with all the spaces, is purposefully designed to be fluid in function. From this vantage point, at the very centre of the house, you can see another of the home’s disarming eccentricities: large windows on either side whose bottom rails slant downwards at one end, following the angle of the elevation. It’s a purely practical way to maximize window size, but it’s also endearingly odd. 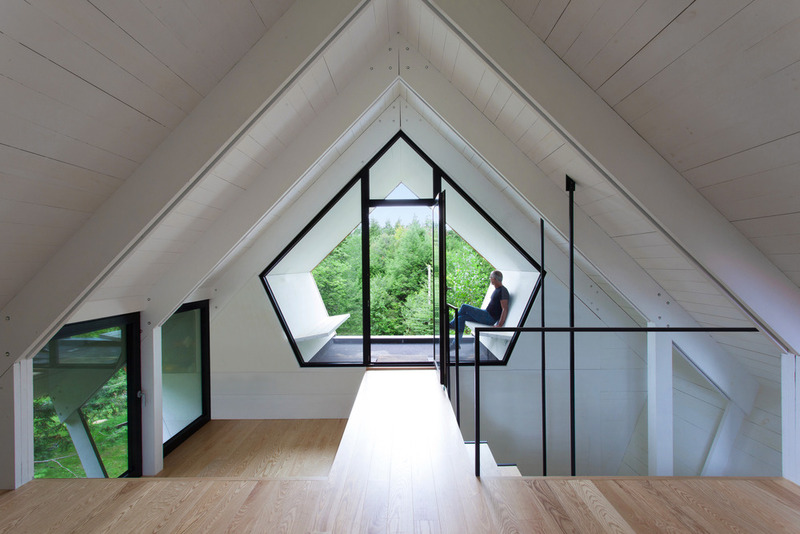 The gallery-style lookout above the treeline forms a beautiful vantage point. 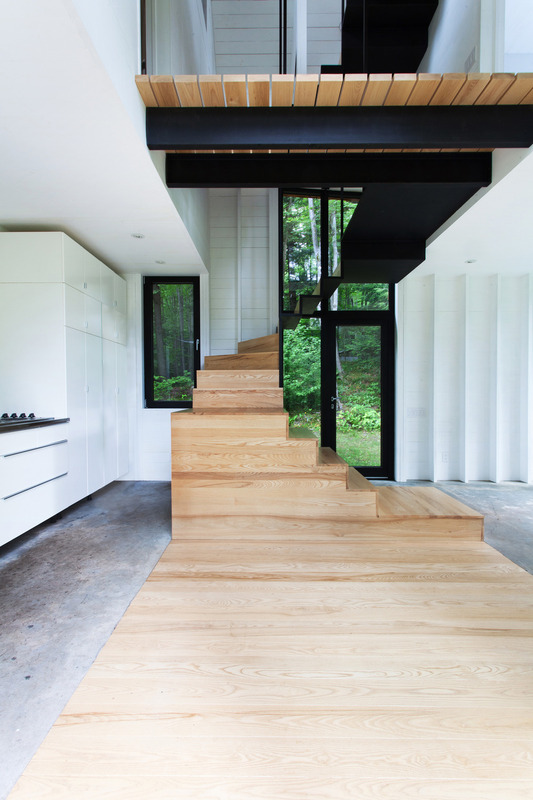 YH2’s Jarnuszkiewicz House and Coupée Croisée were also previously reviewed by Canadian Interiors.